Ten Georgetown Royals are in the goal area trying to hold off Triton in the last minute of the game. 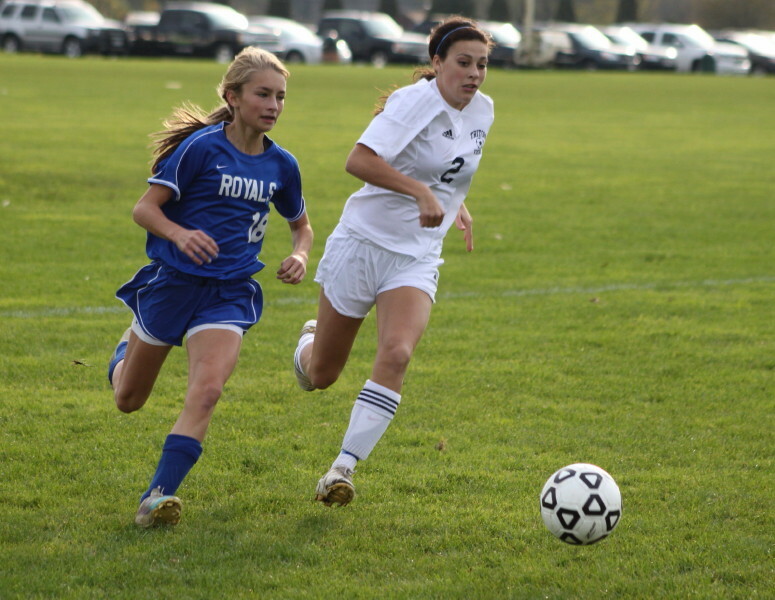 Kristin Hogan (20) defended by Ashley Ross (10) had a goal and an assist for the Royals. 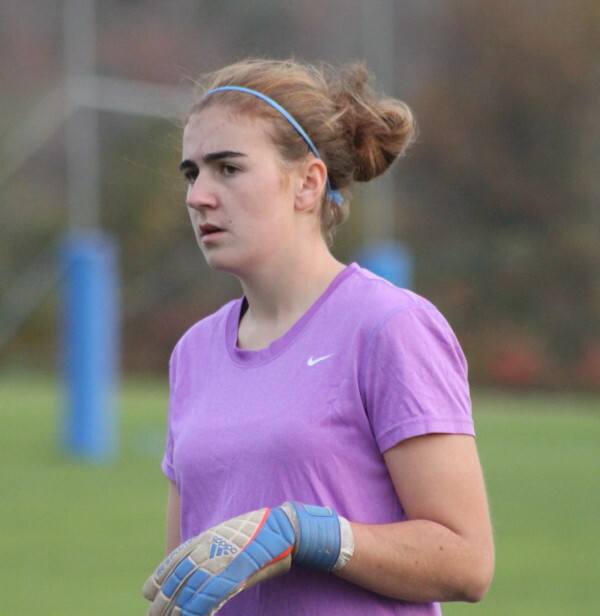 (Byfield) The Triton girls soccer team lost, 3-2, to Georgetown on a nice Monday afternoon at the Central Street Athletic Field in Cape Ann League play. This game was as close as the final score indicates and the talented Royals were fortunate that this one didn’t end in a tie or even worse. And who could see such a competitive game coming? Triton loses to Masconomet, 7-1, while Georgetown ties them. Triton loses to Lynnfield, 7-0, while Georgetown beats the Pioneers, 4-1. The Vikings had won only one game (Rockport 3-1) all season and had been outscored, 25-4, since then. Do you get the picture?? Things were going just about as figured through thirty-nine of the first forty minutes. The Royals had two goals and looked to be in command. But a last-minute long shot from the right by Viking Mackenzie Snow sailed over G’town goalie Jamie Block’s head to give the Vikings a goal….and hope. Mackenzie Snow (8) returns to midfield after a goal in the first half. She had two for the game. I couldn’t help but overhear Georgetown coach Colleen Gibbs getting all over her team during halftime. She wasn’t pleased with the concentration or effort. I’m sure that the last minute goal was part of the frustration. Second half Georgetown dominated early on. Their passing was noteworthy in the midfield area. 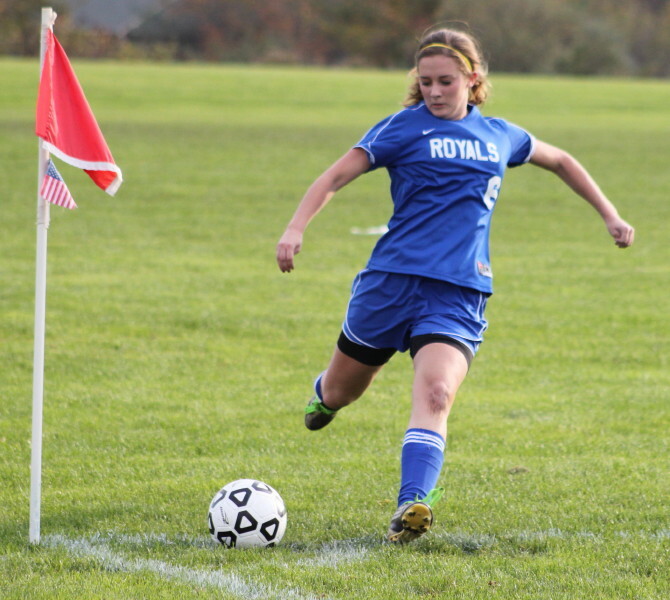 Kristin Hogan registered a goal for the Royals five minutes into the second half with a left-footed shot after a run along the left sidelines nearly to the corner. The shot went over Viking goalie Elizabeth Benoit’s head. Down 3-1, you set yourself for more Royal goals but they never came. There was pressure in the Triton end but the Royals didn’t have their finishing shoes on over the last thirty-five minutes. Triton got the goal back at 23:10 after Mackenzie Snow advanced the ball down the right sideline and later put the finishing touch on from in close to make it 3-2. 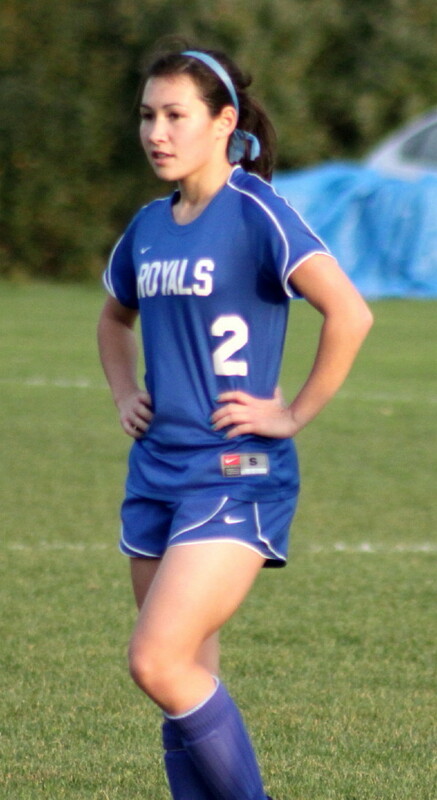 Kristin Hogan had several good looks for Georgetown right after the Snow goal but the Triton defense held. Over the last ten minutes the Vikings really put the pressure on Georgetown. You started to wonder when they would tie the score not if. I counted at least five Triton shots that all had a chance. The picture at the top shows how frantic things got in the last minute. I see nine Georgetown players in close to goalie Jamie Block with six Vikings in the area. I also see the ball just going wide right as a Viking dives after it. Nicole Holland (17) credited with two goals. Rachel Williamson (21) defends. Close, very close, but at game’s end the Royals (7-2-4) had earned 2 points and qualified for the tournament while Triton (1-10-3) had yet another loss. The Royals did not play badly. There were lengthy segments in both halves where they put on a clinic of ball control with pass after pass. Nicole Holland scored the first goal – left foot, left side – after a pass from Kristin Hogan at 14:25. Nicole was credited with the second goal at 36:40. The way I saw it, an Ashley Mueskes corner kick went over goalie Elizabeth Benoit’s head and deflected in off of teammate Ashley Ross. Nicole was closest to where the ball was when it was inadvertently deflected in. I thought the game was at Triton High School. Wrong. The boys soccer team was playing North Reading there. 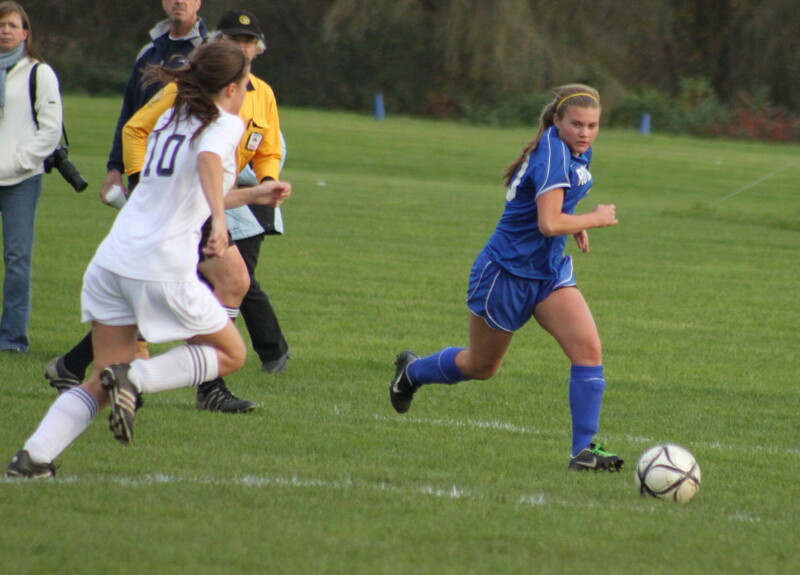 The Central Street Athletic Fields have two soccer fields so both the varsity and JV games went on together. 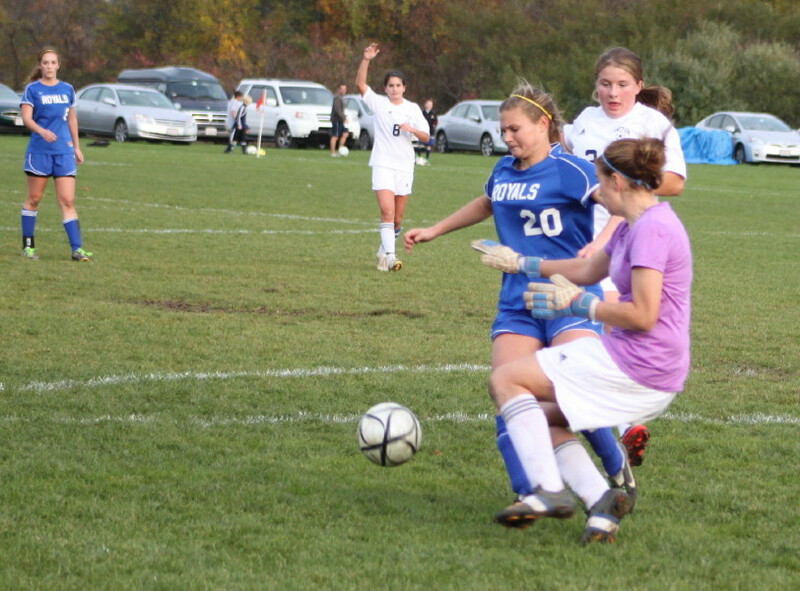 Triton goalie Elizabeth Benoit was run into at least four times yet held on. Kelly Chickering was terrific…..as usual. Her speed and ability to control the ball are eye-catching. I try to imagine what she might be like in the attack zone. A big advantage for Georgetown was the lengthy goal kicks by Jamie Block. The distance is impressive as well as the height. No one was on hand to chase balls going out of bounds. The clock ran as players chased errant shots and passes. Triton next game is tomorrow (Tuesday October 25th) at Ipswich at 6:30PM. Georgetown gets Amesbury at Georgetown tomorrow (Tuesday October 25th) at 3:45PM. (I take my own pictures and draw my own conclusions. I own any mistakes.) Clicking on a picture enlarges it to normal size.